Having spent a semester studying international business in Bangkok and passing through the city 5 or 6 times on various trips to Southeast Asia, I’ve spent more time in Bangkok than in any other city outside of Nashville, Tennessee and Durham, North Carolina. Many people arrive in the city counting the seconds until their departure, overwhelmed by its size, congestion and pollution (which seems to be steadily improving). I’ve only had the opposite reaction. Of the many foreign cities I’ve visited, it is one of the few where I would consider residing. During Shanna’s two prior visits with me to Bangkok, we skipped the sites and took advantage of the many cosmopolitan offerings of this large city, sampling the amazing food on offer at the countless restaurants and visiting the upscale day spas where a half-day at the spa costs the equivalent of 15 minutes in a American spa. On this visit, however, I felt obliged to accompany Shanna and our friend Dana on an afternoon visit of the most prominent sites in Bangkok. After a short boat ride down the Chao Phraya River (the heart and soul of Bangkok), we arrived at the Grand Palace – the former residential complex of the King. 1 While we are definitely at temple overload considering our six months in Asia and the approximately 1.2 million temples/wats/pagodas we’ve visited, the sites at the Grand Palace didn’t let us down. The Grand Palace complex consists of multiple buildings (including the Grand Palace, which is unfortunately closed to the public) with the most impressive being Wat Phra Kaew. 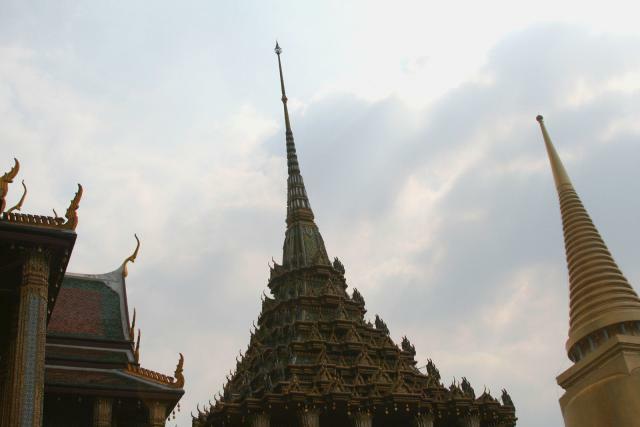 This ornate wat, described by Shanna as the Taj Mahal of wats, contains the venerated Emerald Buddha, a fairly tiny Buddha statue actually made of jade (not emerald). 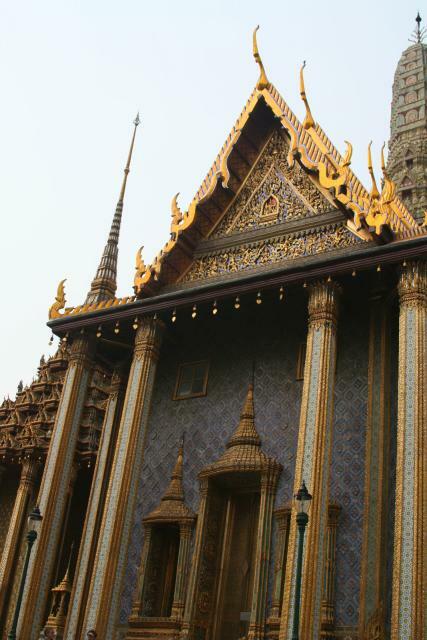 Next, we walked through the crowded Bangkok streets to Wat Pho. From the outside, this wat would look fairly ordinary. However, the interior contains the largest reclining Buddha statue in the world, measuring almost 150 feet long and 50 feet high and filling almost every inch of the wat. The reclining Buddha, modeled out of plaster around a brick core and finished in gold leaf, contains a rather content smile – representing the euphoric feeling of the Buddha as he prepares to enter nirvana and end the cycle of reincarnation. 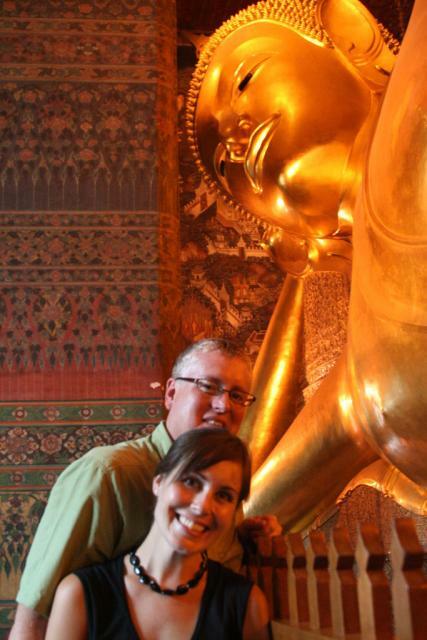 These world-class sites are a must-see in Bangkok and a fitting end to our sightseeing in Asia.